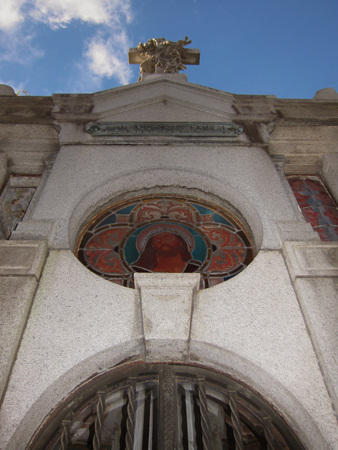 Sadly, two posts in a row deal with damage & destruction inside Recoleta Cemetery. 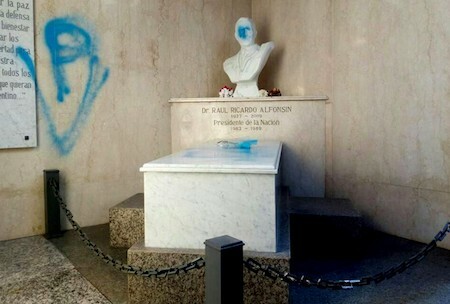 The tomb of former President Raúl Alfonsín was spray painted on 05 Jun 2017 with the pro-Peronista symbol “PV”, Perón vuelve. 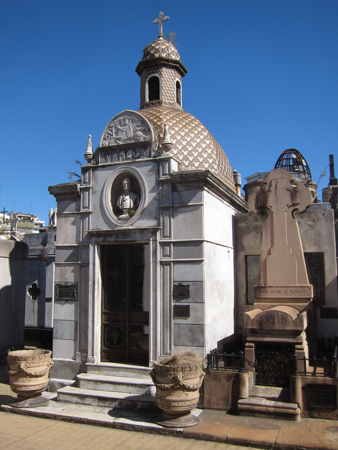 Alfonín passed away in Mar 2009 after a long battle with lung cancer & was buried with much fanfare, fitting of someone so important in national history (for more info, see the 4-part Death of a President series). This method of showing political disagreement should never be considered acceptable. National representative Ricardo Alfonsín (of the Cambiemos-Unión Cívica Radical party) today thanked those who called him concerning the vandalism of his father’s mausoleum located in Recoleta Cemetery & confirmed that he would not accept any candidacy. After a reunion with Governor María Eugenia Vidal, in which it was rumored that the leader of Buenos Aires province offered him a post, Alfonsín reassured that “the meeting took place & we talked about many things, both sides showed courtesy, kindness & frankness”, but emphasized that he does not want “to be a candidate for an elected position, either in Argentina or in a foreign country”. In statements to Télam Radio, Alfonsín said that he received calls offering support after news of vandalism of the mausoleum of the deceased ex-President Raúl Alfonsín had been made public. “In every country around the world there are powerful personalities with anti-democratic ideas who do this kind of thing, which we always must renounce regardless of who is the victim”, he affirmed. Among those who communicated with the Cambiemos representative are the Minister of Security, Patricia Bullrich; the head of the Federal System of Media & Public Content, Hernán Lombardi; the ex-President Cristina Fernández de Kirchner; the ex-Minister of Transportation Florencio Randazzo; and the former head of the Cabinet Aníbal Fernández, as well as “all members of the Radical political party”, the Governor of Santa Fe province & the national head of the Socialist Party Antonio Bonfatti. In this context, Alfonsín complained that the during the period of government under Cambiemos, the UCR party had maintained “a rather passive role which has harmed society” & added that “no one should be surprised, therefore, that disagreements would present themselves”. At the same time he admitted to be “working” so that “in 2019 there will be a Radical party President”. Photo from the Télam news agency. Born in 1802—a few years before independence from Spain—Valentín Alsina studied law & obtained his first government post under the presidency of Bernardino Rivadavia. Short-lived, politics became much more complicated after Rosas took charge in 1829. Although Alsina formed part of the opposition to Rosas, he was protected by his father-in-law, Manuel Vicente Maza… an early Rosas supporter who switched sides & was eventually assassinated by Rosas’ troops. 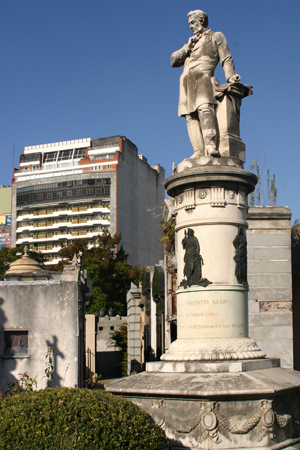 Arrested & imprisioned, Alsina managed to escape to Uruguay in 1837 where he continued to oppose Rosas in the newspapers, along with other exiles like his neighbor in Recoleta Cemetery, Florencio Varela. 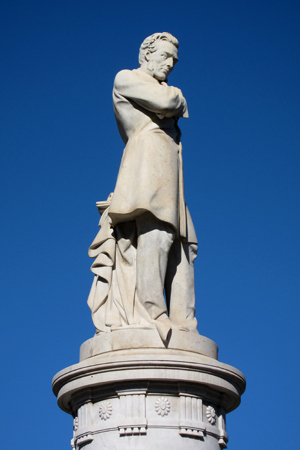 After the defeat of Rosas in 1852, Alsina returned to Buenos Aires to oppose Urquiza as well. He was elected Governor of Buenos Aires but served for only a brief period due to another uprising. The following year Alsina presided over the committee which adopted the first provincial constitution, separating Buenos Aires from the rest of Urquiza’s Confederación Argentina. 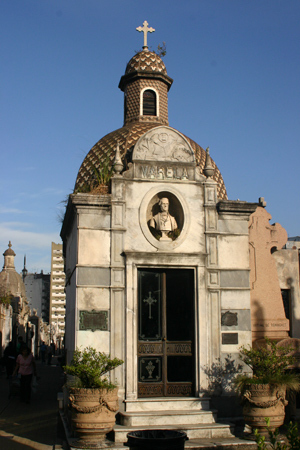 During this period, he oversaw the opening of the first rail line in Argentina & brought back the remains of his former boss, President Rivadavia, for burial in Recoleta Cemetery. 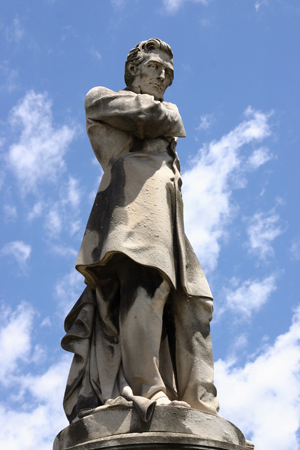 After winning the 1859 Battle of Cepeda, Urquiza forced Buenos Aires to join the confederacy & Alsina had to step down. But he continued in government & occupied the top spot in the national Senate where Valentín sweared in his son, Adolfo Alsina, as Vice-President under Domingo Faustino Sarmiento. He passed away soon after in 1869. 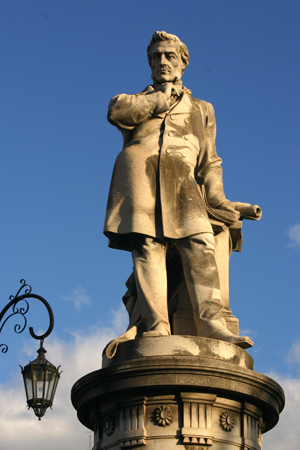 Of his numerous contributions to Argentina, Alsina is probably best known for being the first director of the provincial institution which would later become the National Library as well as the author of the nation’s first penal code. Update (19 Aug 2014): The Biblioteca Digital Trapalanda (part of the Biblioteca Nacional) recently made the following image from 1876 by photographer Christiano Junior available. Wish those trees were still around! Born in 1880—just as Argentina settled decades of internal conflict & millions of immigrants began to arrive—Alfredo Palacios would be remembered as the first Socialist Party member elected to any congress in Latin America. 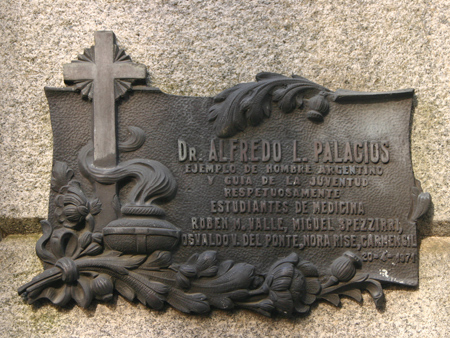 Palacios’ early life was not easy, especially after his Uruguayan father decided to recognize legally all 19 of his children… Alfredo being one of the illegitimate ones. This meant little money in the household, but Palacios worked hard to get a good education. Palacios experienced a memorable first term in Congress when he uncovered & exposed money laundering in—of all things—the construction of the national Congress building itself. Briefly kicked out of the Socialist Party for wanting to settle a disagreement with a duel, he continued to be active in various universities & traveled extensively throughout South America. Palacios opposed US intervention in Latin American affairs during the 1920’s as much as he opposed the 1930 military coup in Argentina. Other causes dear to Palacios were repatriation of the Falkland Islands, better health care & living conditions in northern Argentina & in 1938 he tried to pass a bill for female suffrage. He remained at odds with Perón & had brief conflict with every administration afterwards. Palacios always remained true to socialist principles, even giving half his income to the Socialist Party. In 1965 while serving as a diputado in Congress, Palacios passed away with practically no money to his name. He never married & had no children, so I’ve been unable to determine how or why he was buried in the Arroqui mausoleum. Perhaps a brother or sister married into the Arroqui family? If anyone has additional information, please post a comment below. Coronel Juan de Dios Rawson, whose father came from Massachusetts, fought in several battles during Argentina’s early years of organization, including the Guerra de la Triple Alianza. He was also the half brother of Dr. Guillermo Rawson. But his great-grandson, Arturo Rawson, became President of Argentina… for only 72 hours. Rawson had a long career in the military & rose to the rank of General after several decades of service. As commanding officer of the cavalry, he possessed the troops needed to stage a successful coup d’etat already planned by the GOU (Grupo de Oficiales Unidos) in 1943. This secret, informal collection of officers aimed to end the Década Infame where electoral fraud kept the same people in power year after year. 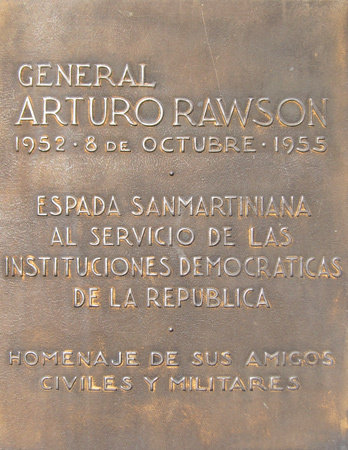 On 04 Jun 1943, Rawson marched 10,000 soldiers into Buenos Aires & took control of the country. While naming fellow officers to government positions & before he was sworn in as de facto President, the GOU realized they had made a mistake in asking Rawson for help. He supported the Allies in World War II while the GOU thought Argentina should remain neutral. Juan Domingo Perón, along with other GOU members, forced Rawson to resign & General Pedro Ramírez took his place. For a brief period Rawson served as ambassador to Brazil. He also supported an attempted coup to overthrow Perón’s government in 1951. Rawson died of a heart attack the following year & did not live to see the eventual ousting of Perón in 1955. Florencio Varela was born in Buenos Aires in 1807 (pre-independence), with his father passing away when he was only 11 years old. As a child, he earned a grant to attend the Unión del Sur school, recently founded by General Juan Martín de Pueyrredón. His university studies began four years later, & in 1827 he obtained a doctorate in Law. While studying, Varela wrote his first literary piece & was published in newspapers edited by his older brother, the famous poet Juan Cruz Varela. 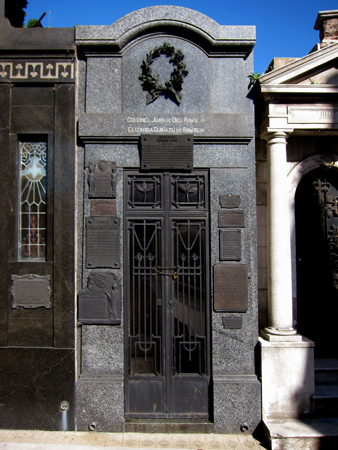 Florencio’s brother also inspired Unitarian ideas that led him to leave Argentina in 1829 after Lavalle ordered the execution of Manuel Dorrego. Complicated times. Exiled in Montevideo, Varela married Justa Cané, had 11 children & spent most of his time working as a lawyer. But during this period, Varela came to be known as much for his literary talent as for his flair for politics. He participated in early elections in Uruguay, supporting Fructuoso Rivera over General Manuel Oribe who shared ideas similar to those of Juan Manuel de Rosas. In 1843 while Montevideo remained under siege by Oribe, Varela was sent to Europe in an attempt to obtain English & French support against the growing influence of Rosas. The UK turned a deaf ear to Varela although he took advantage of the trip to visit museums, monuments & factories. Later in Paris, he met with Alphonse Thiers, & the French Congress agreed to put the struggles in the Río de la Plata on their agenda. In the French capital, he also conversed with the aging General José de San Martín & met Louis Daguerre who explained to Varela details of the latest invention: photography. He brought back to the Río de la Plata one of the first early cameras. 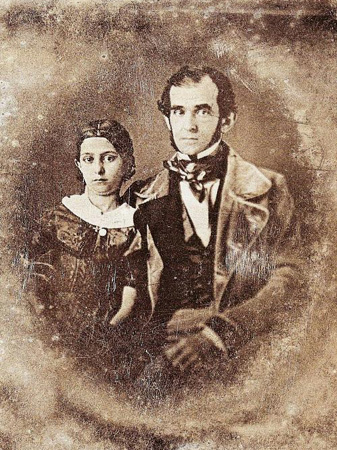 The daguerrotype below is of Varela & his daughter, María, taken by an unknown author in 1847. Immediately after returning to Montevideo, Varela founded the newspaper “El Comercio del Plata,” fighting Rosas from its pages & supporting European intervention in the region. Miguel Cané (father) & Valentín Alsina collaborated with Varela, & Alsina would become editor after Varela’s death. 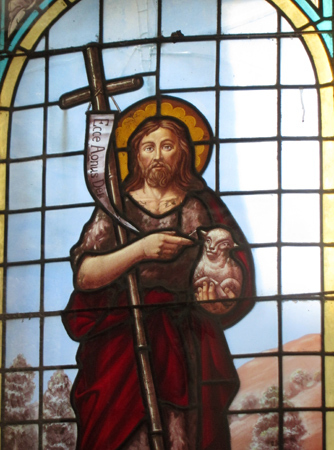 On 20 Mar 1848, Florencio Varela was stabbed in the back & murdered. His assassin declared on trial that he had been sent by Oribe’s men. 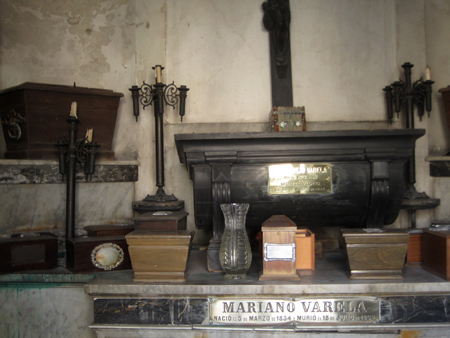 Interestingly enough, Florencio Varela’s ashes lie among many members of his family, but his wife is not here. 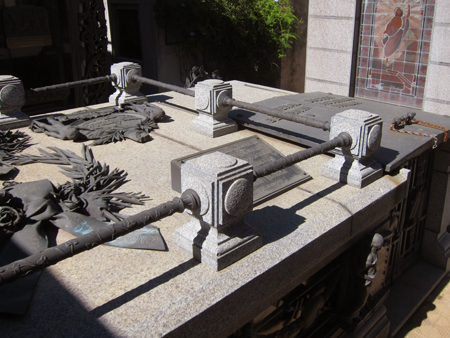 After the assassination of Varela, Justa Cané married again—to Doctor Andrés Somellera—and her remains are in that family’s vault. Justa survived Varela by more than half a century, passing away in 1910. 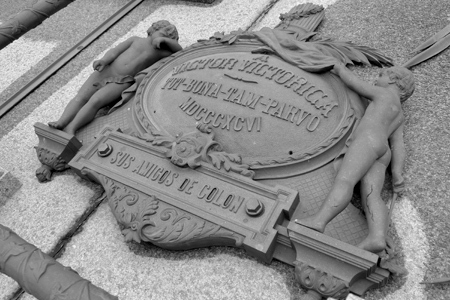 One of the most populated areas of the Province of Buenos Aires commemorates the reporter since 1891. In 1883, that same province also issued a bill with portraits of Valentín Alsina & Florencio Varela with the value of 2 gold pesos. The currency shown above is courtesy of Billetes Argentinos. 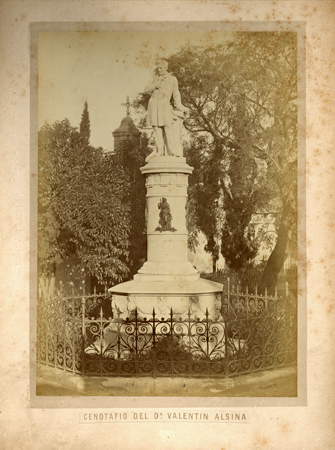 After the defeat of Rosas in the 1852 Battle of Caseros, Urquiza personally requested to see Victorica. 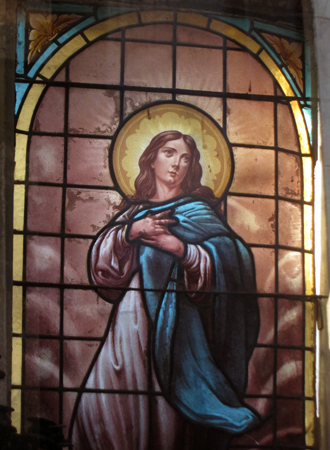 They became good friends almost immediately with Victorica even marrying Urquiza’s daughter, Ana Dolores, in 1857. Definitely a change of heart! Victorica decided to stay in the new national military & served as Urquiza’s personal secretary. 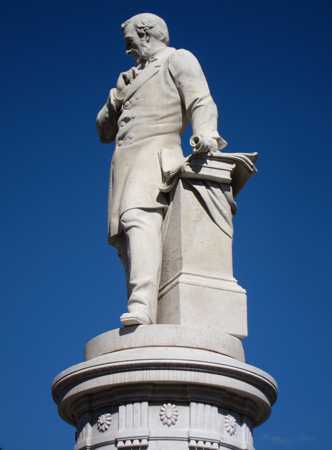 His rise in power continued when named Minister of War by President Derqui in 1860, followed by a term as Senator, working for the Department of Education & even taught law classes. Under Roca’s presidency, Victorica once again was named Minister of War & helped establish Argentine outposts in Tierra del Fuego. But his most infamous legacy was leading the campaign against the indigenous tribes in the Chaco region. Winning the conflict, Victorica raised the Argentine flag… topping the mast with the bloody head of Yaloschi, the Toba chief who fought Victorica’s troops. Various other offices occupied Victorica—not the least of which was Chief Justice of the Supreme Court—until he passed away in 1913. 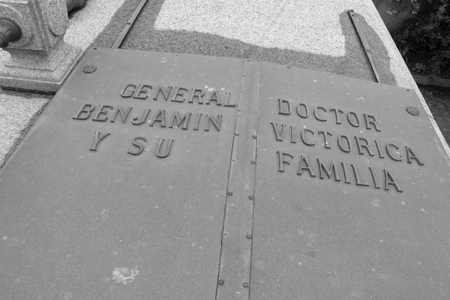 This crypt has also been used by Victorica’s seven children… tucked away in a quiet corner of the cemetery & covered with symbols of law & military service.